You’re sitting at your favorite sushi restaurant when the waitress brings your sake on a tray. The petite porcelain bottle is so hot you can barely grasp it long enough to pour a tiny cupful. When the fiery liquid scorches your throat, you probably shrug and think, “That must be Japanese culture.” Wrong! That’s what Japanese people consider as American culture – an expectation for hot food to be extremely hot. 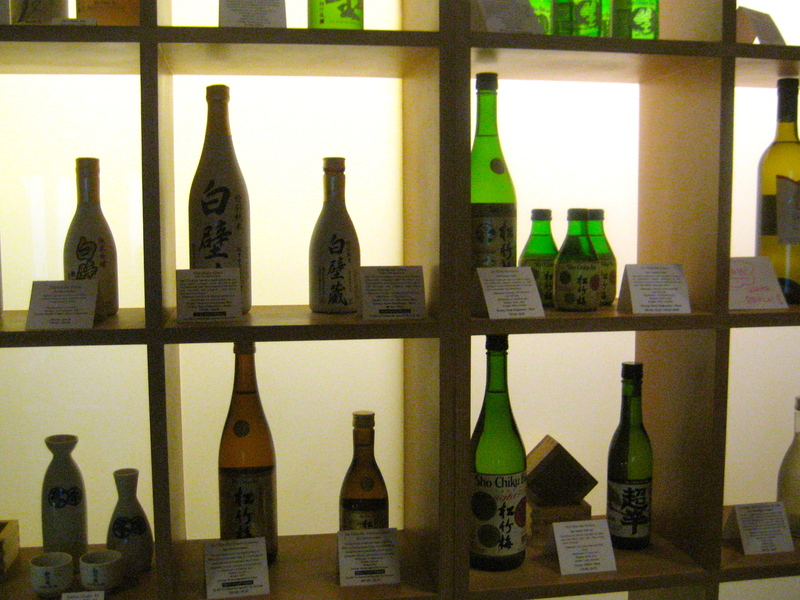 In Japan, sake has been drunk for 2000 years at a warm 100–105 degrees, just a little above body temperature. 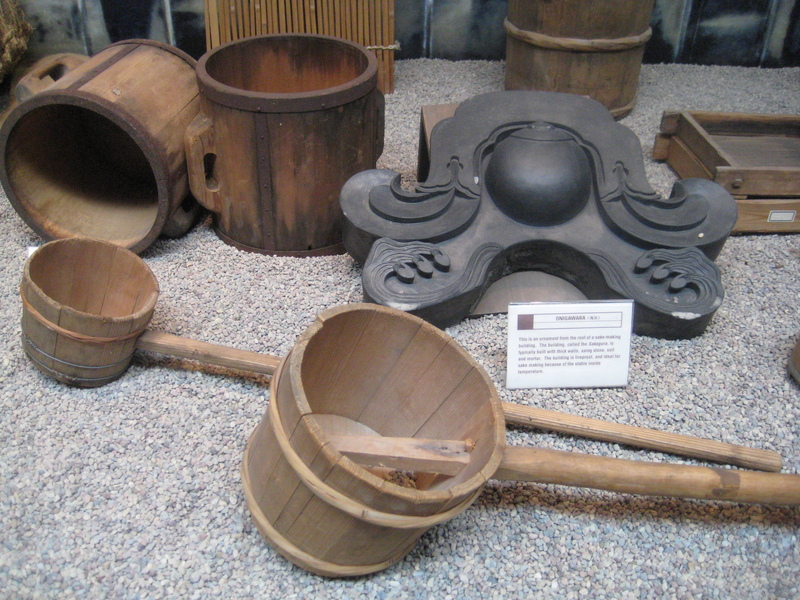 This tidbit and many more details of sake culture and history were revealed during my recent visit to Takara Sake Museum and Tasting room on Addison near University. Senior manager, Izumi Motai, gave me a short introduction to the history of sake production, led me through a museum of 19th and 20th-century sake making tools and ended the tour with a tasting course of half a dozen sakes. “Berkeley is a unique place for sake-making, environmentally, geographically and politically, plus the great interest in food culture,” says Motai. “The weather is perfect too, with a cool sea breeze.” The two most important ingredients — rice and water – are readily at hand: Japanese varietal rice from the Sacramento valley and water from the Sierra Nevada. Japanese rice farming in California can trace a 100 year-history (with two intermissions: Prohibition and World War II). 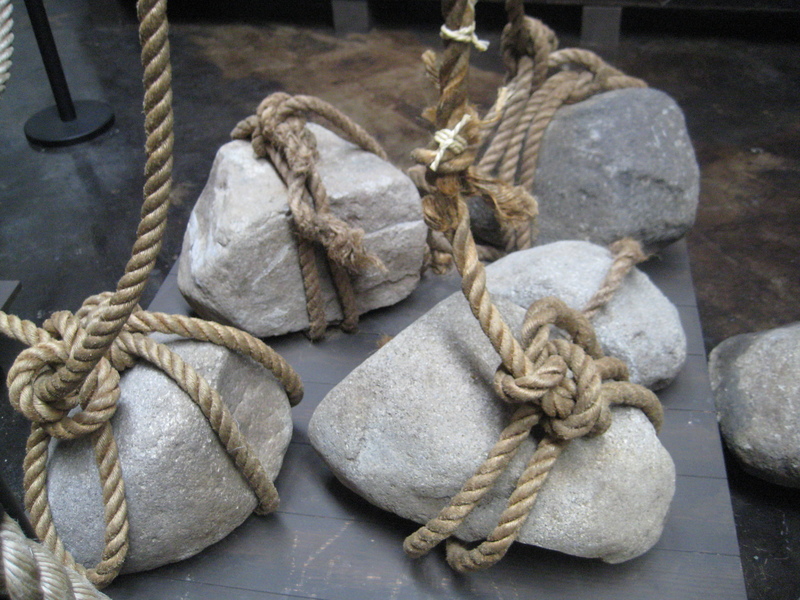 involved in making sake, which have not changed in thousands of years; only the equipment has been modernized. Basically, the rice grain must be processed to remove several outer layers – (therefore, brown rice sake would never work.) First, the rice kernels are gently put through a stone mill, then the starchy inner kernel is washed, soaked, steamed, sprinkled with a special mold called koji, mixed with more water and rice, warmed, exposed to yeast from the air, pressed, filtered, pasteurized, aged for 4-6 months and ta-da: sake. We move into the airy, spacious tasting room flanked by an elegant wooden structure inspired by ancient Shinto shrines. The pattern of the blue glass tiled floor suggests a stylized rice paddy. All materials are recycled, reflecting a deep respect for nature. Mr. Motai pours me the first of 6 tasting cups of sake, moving from lightest to most full-bodied, ending on a sweet note. As he pours my first sample, cold Ginjo sake, he mentions that this light, mild sake with only 12% alcohol is emblematic of the large cultural changes in the evolving role of women in Japanese society. Previous to WW II, he explains, Junmai was the classic form of sake, drunk almost exclusively by men and often to excess. It was never drunk by itself, but always as an accompaniment to food in the various sushi, yakitori, tempura shops where, in the traditional 20th century pattern, men went out together after work. But about forty years ago, Motai tells me, women’s lives began to change; they married later, worked outside the home more, developed more economic independence and opportunity. Ironically, this resulted in the invention of a new type of sake that women could enjoy. The Ginjo style is pristine, gentle, fruity and often sipped chilled in a wine glass without the necessity of food. I work my way pleasantly through 5 more robust and pungent sake samples, including – only in Berkeley – organic sake. 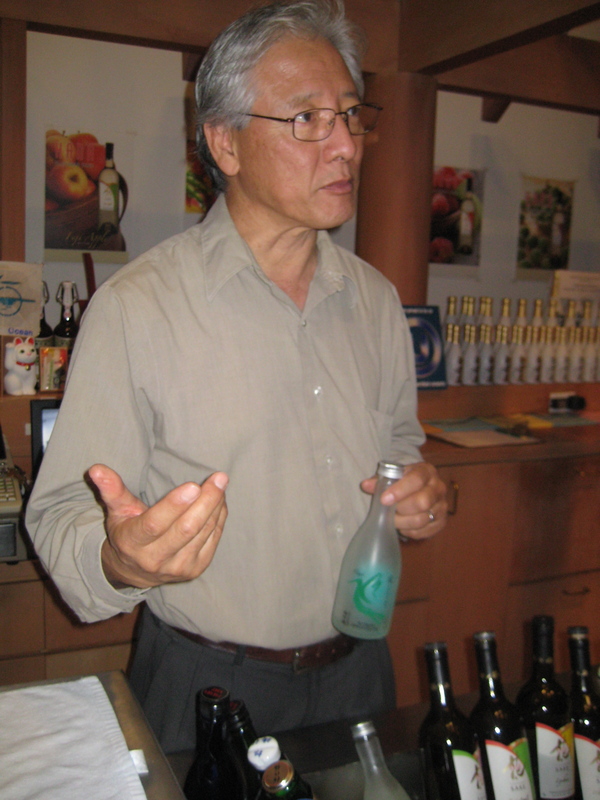 Mr. Motai clarifies that calling sake “rice wine” is a misnomer. Since it is made from water and grain, it has more in common with beer. 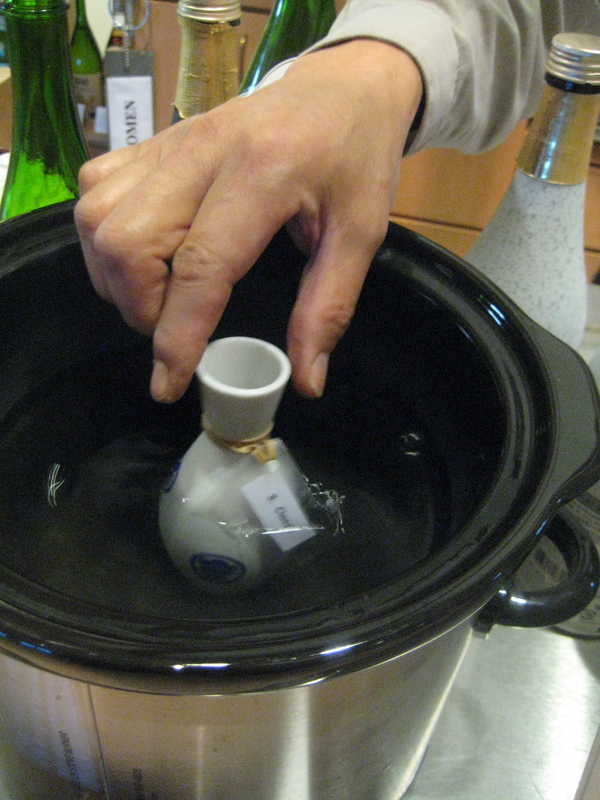 He demonstrates the proper way to heat warm sake, by placing the sake filled vessel in hot (not boiling water). I end the afternoon and the tasting session with a thrilling dessert, their newest flavor: White Peach Sake. 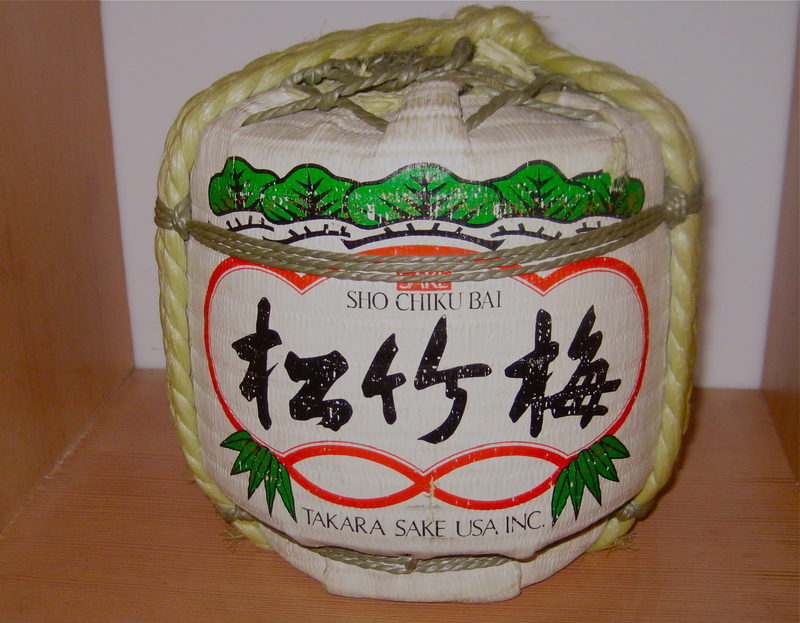 This entry was posted in Japan and tagged sake, sake museum, sake tasting Berkeley, Takara sake. Bookmark the permalink. Thanks for posting this! I always wanted to do this. 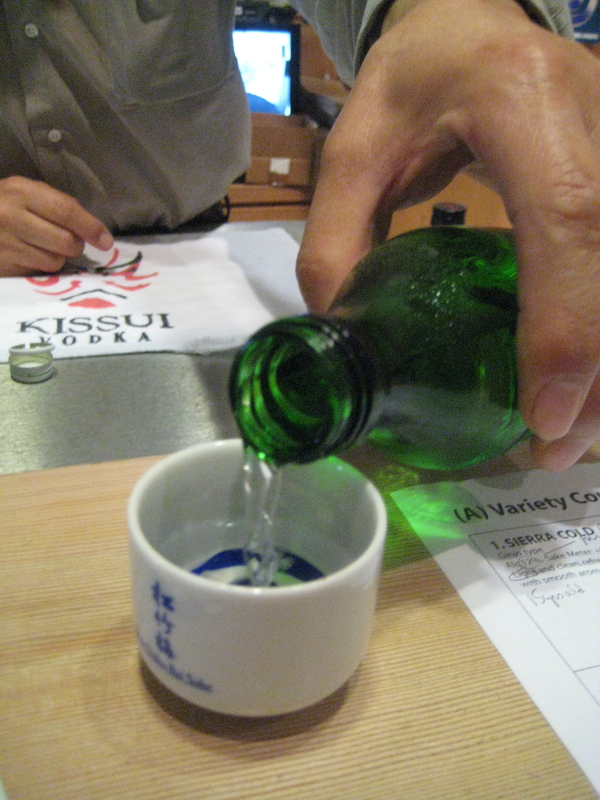 I’m over in that area at Vik’s or Grocery Outlet all the time, and tell myself, “I should take the sake tour!” Now I know more about it and will make it there – for sure.